Ok, this is one of those memorable recipes that a dear friend Kelly gave to me when we were here in San Antonio several years ago. She and her beautiful daughters were such an instrumental part of our lives as my girls became friends quickly with hers. God just loves to do that sometimes. Kelly was my rock while they lived here for a short time and we shared so many things. 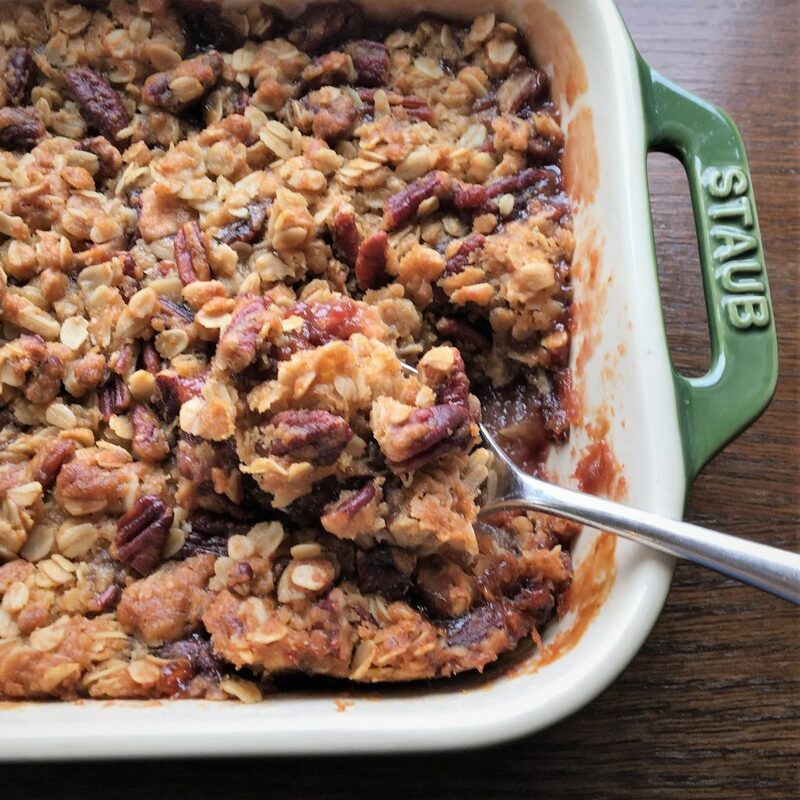 One Thanksgiving that we were able to spend together, she made this amazing Cranberry Apple Casserole. I was hooked. It is sort of a dessert, but can easily replace the usual cranberry sauce you have on your menu. I am so grateful for all Kelly shared and taught me over the years. Our friendship is still strong to this day, as we pick up right where we left off any time we are able to spend time together or just talk. There is not too much that goes into this recipe for Cranberry Apple Casserole. 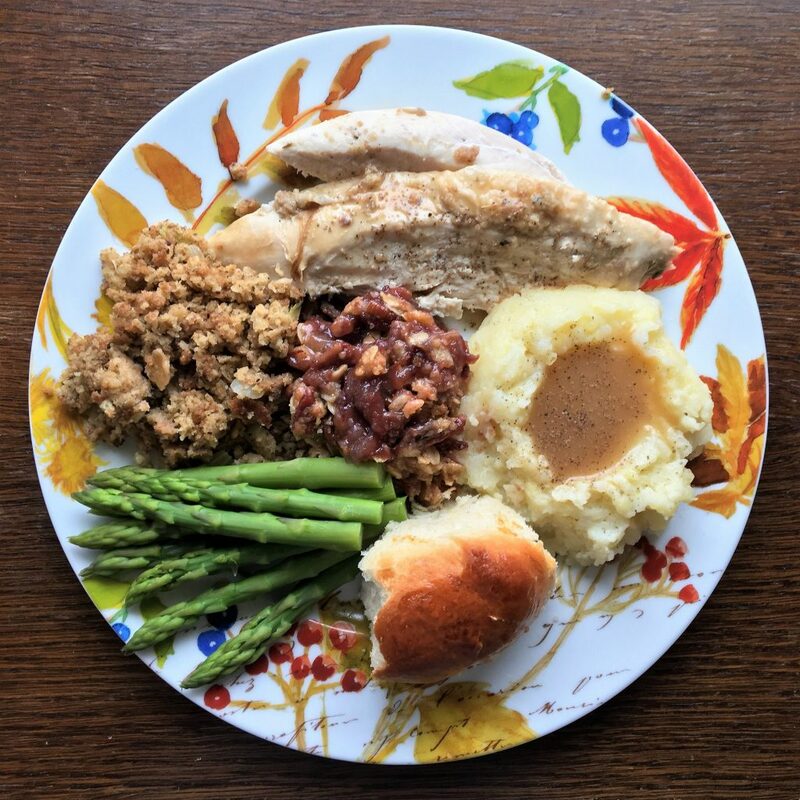 It is super simple and it will be a sure hit at any holiday table. I love how the tartness of the cranberries compliment the sweetness of the apples and other ingredients. 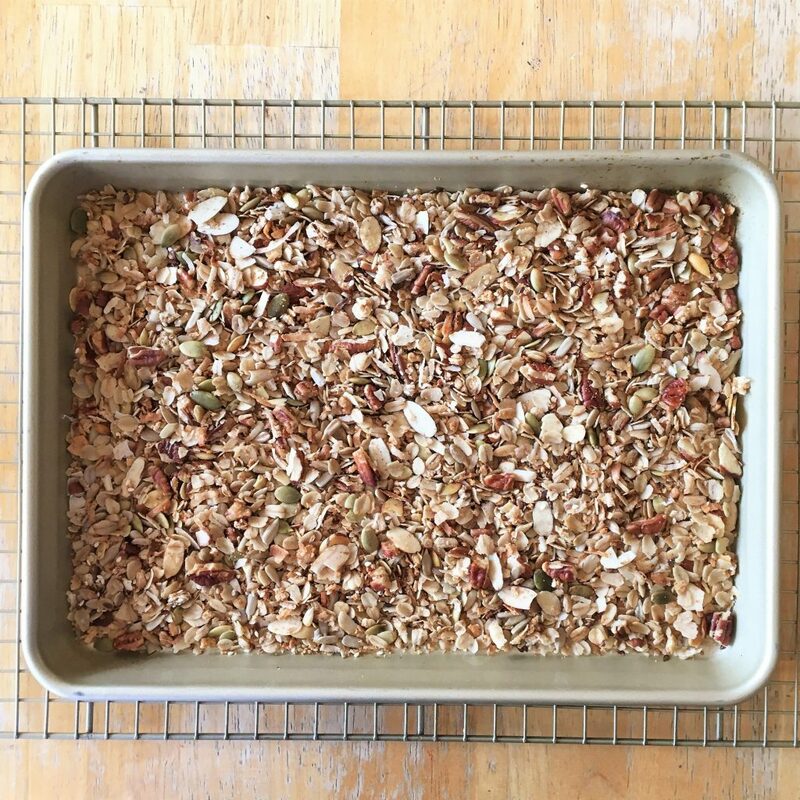 And the oatmeal adds an awesome crunch to the topping of this casserole. Again, it can be served as a side dish or dessert, depending on how you want to make it a part of your holiday meal. But, holiday aside, you can make this any time of year as a side to pork, poultry or beef. From the Memorable Kitchen, this is one of those recipes that does not have to have too much explanation. It is a recipe from a beloved friend, who is etched in my heart forever. The recipe is just a small part of what Kelly brought to my life and still does. The cooking and recipes we have shared are just one aspect of what we share as friends. It is so much deeper than that, as too often she was my voice of reason, shoulder to cry on and Christian friend. I hope all of you have a Kelly in your life. It will change your world. Love and hugs from the Memorable Kitchen. Mix together apples, cranberry sauce, 2 tablespoons flour and ¼ cup sugar. Mix thoroughly and place in a 9 x 13 inch baking dish that has been sprayed with cooking spray. Mix together oatmeal, pecans, ⅓ cup flour, brown sugar and melted butter, until crumbly. Sprinkle over apple mixture. Bake at 350 degrees for 45 minutes. Serve as a side or dessert. I first started making Homemade Mac and Cheese for my family years ago. Of course the little box with the bright orange cheese powder, you buy at the store, was always my kids’ favorite, but one day I decided to start making it from scratch for several reasons. 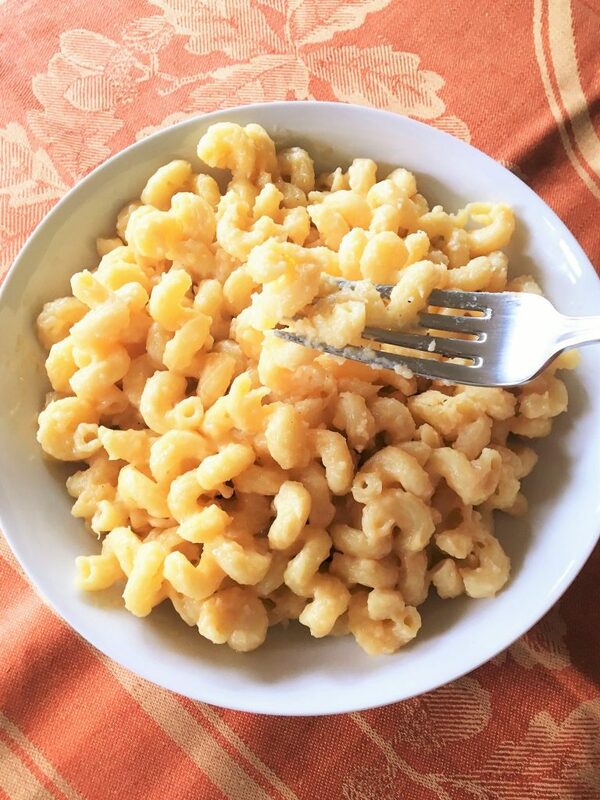 I started making Homemade Mac and Cheese and other dishes in a effort to cook more at home as opposed to eating out, and I loved knowing where all the ingredients were coming from in my recipes. 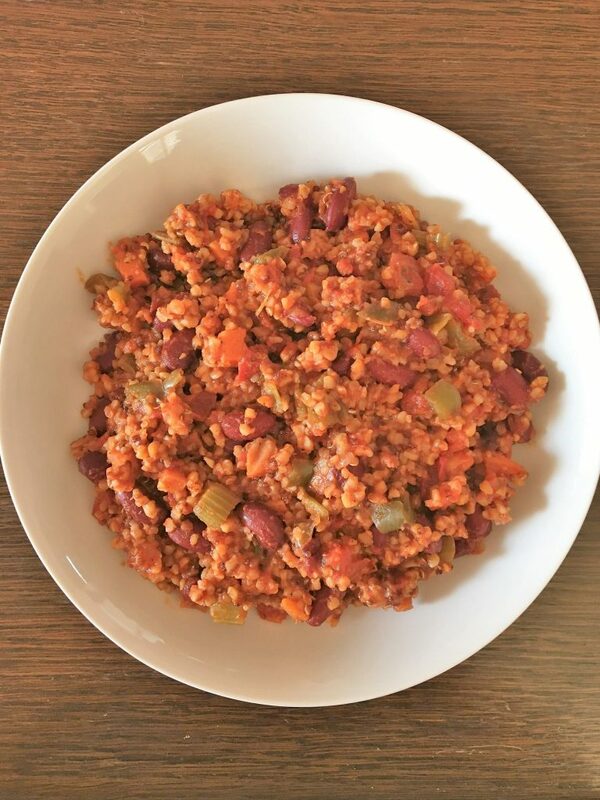 This recipe is also really quite simple to make and once you have mastered it, you will have lots of fun changing up the ingredients to suit your taste. You may even slip in some veggies that your family will hardly notice due to the yummy, creaminess of this incredible dish. Now, there is more to this recipe for Homemade Mac and Cheese then it just being super delicious. 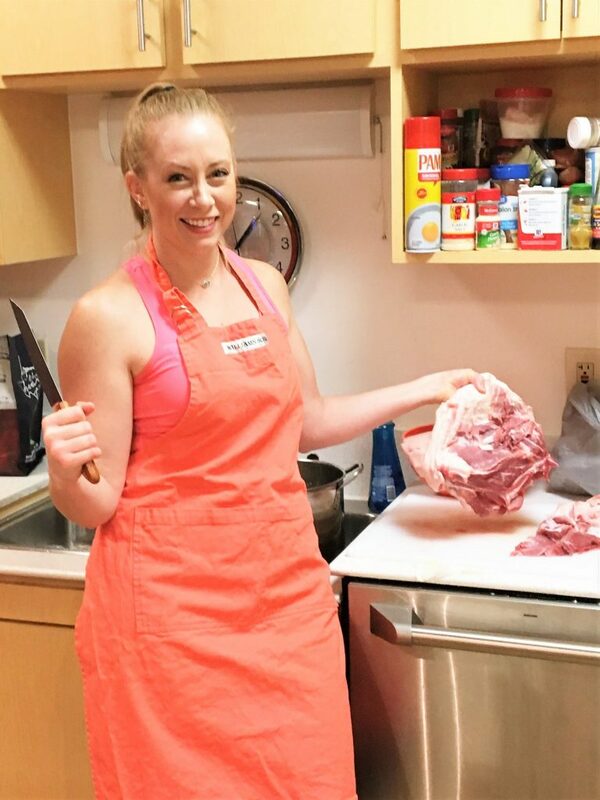 It became a hit this past year at one of our USO Wellness Wednesday Cooking Sessions. Let me explain, if you are not familiar with the USO and Wellness Wednesday for that matter. The USO is the United Services Organization, that has centers all over the world for our military members’ rest and relaxation. A few years back a new USO Center was built here in San Antonio and I was fortunate enough to be a part of their program called Wellness Wednesdays. It is the day that my crew and I get to make homemade food for the troops and spend some special time getting to know them. Most of them are here in training and are far away from home. We love being able to share what we love doing and bring a little bit of home back to them. We call it Wellness Wednesday because we also teach them how to cook wholesome healthy food in their own home…Or the home they will one day have once they are out of the barracks. I think it is more like a “Mental Wellness Wednesday” as we get to share some home cooking and heartfelt gratitude for what they do. So, this particular Wellness Wednesday I was fortunate to have a whole crew of people to helps me, and they were fantastic. 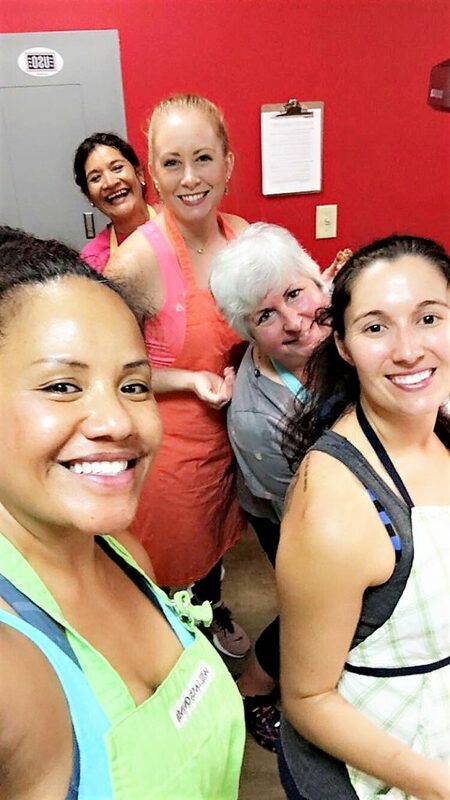 There usually is a core group of about 3 cooks, but it often turns into a fun “family” of volunteers as many of us bring our friends to share in the experience. So, this Wednesday I had an awesome crew of ladies who were such a blessing and were so engaged in the mission of serving our troops. Some were seasoned cooks and others were beginners. 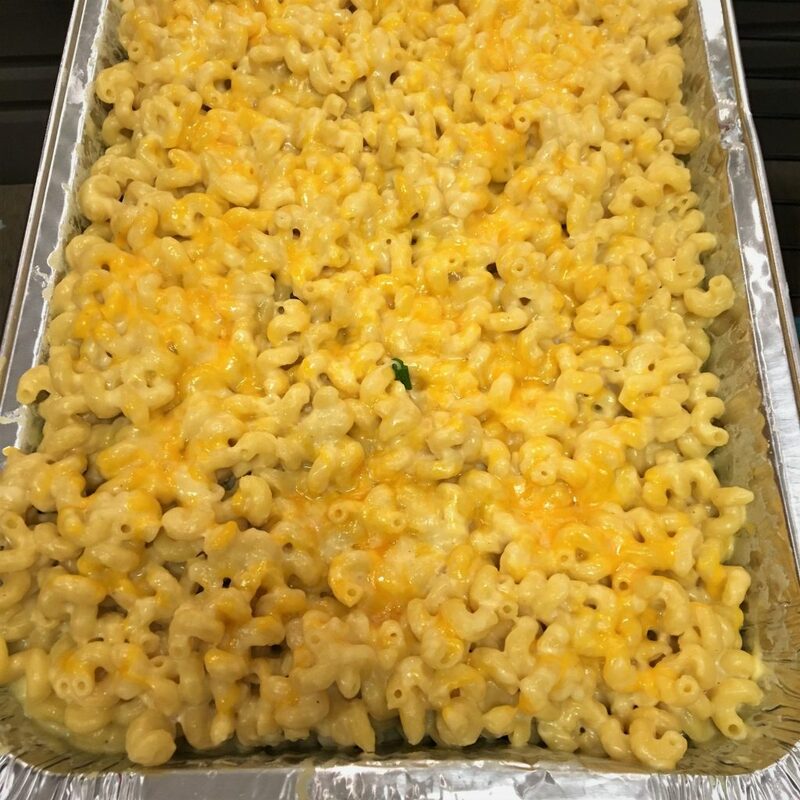 I had the opportunity to teach one of our beginner cooks how to make this incredible Homemade Mac and Cheese. She did an awesome job and was so eager to serve it up to the troops. As she gave them there serving of her delicious dish, she also served lots of smiles and love. So, we lovingly renamed this dish, “Marry Me Mac and Cheese”, in honor of Sarah. 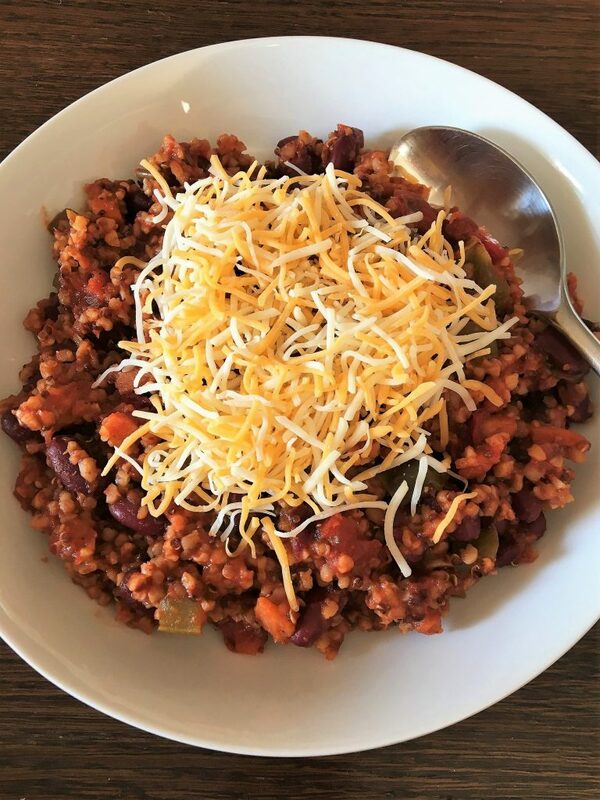 We are not sure if it worked, but anyone who makes this dish is sure to have lots of good vibes as we made it with all the love in the world. 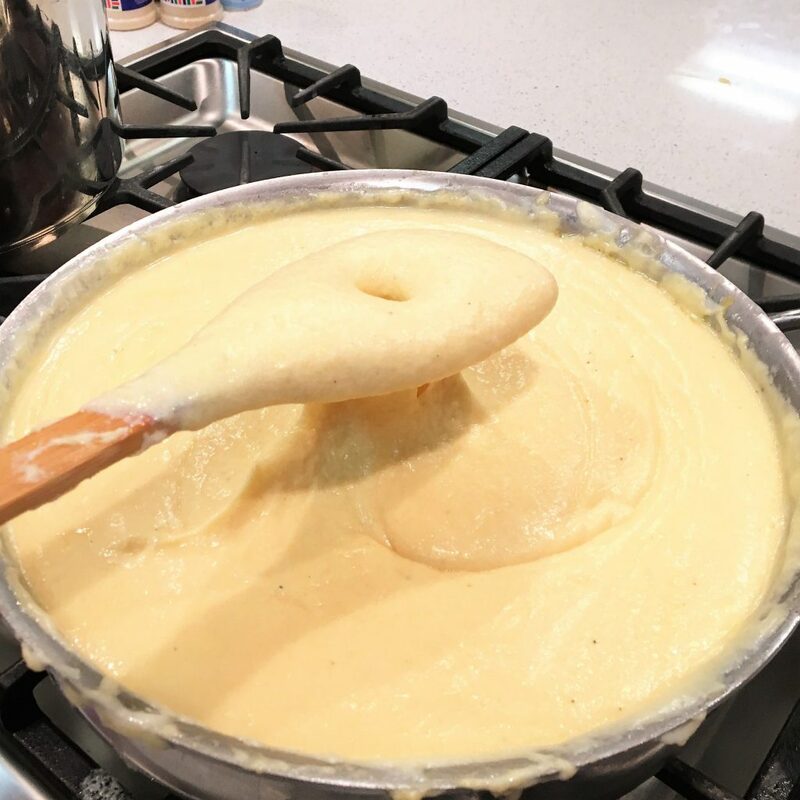 So, I know many people are nervous when it comes to making a bechamel sauce or cheese sauce like the one required for Homemade Mac and Cheese. There are a couple of tricks to making it work. Not too technical, but just some common sense tips. First, do not heat your butter and flour on too high of a heat. When you whisk in the flour, make sure your break down the flour against the sides of the pan and cook it about 1-2 minutes to ensure the flour is cooked down. Next, make sure you heat up your milk/half and half in the microwave. 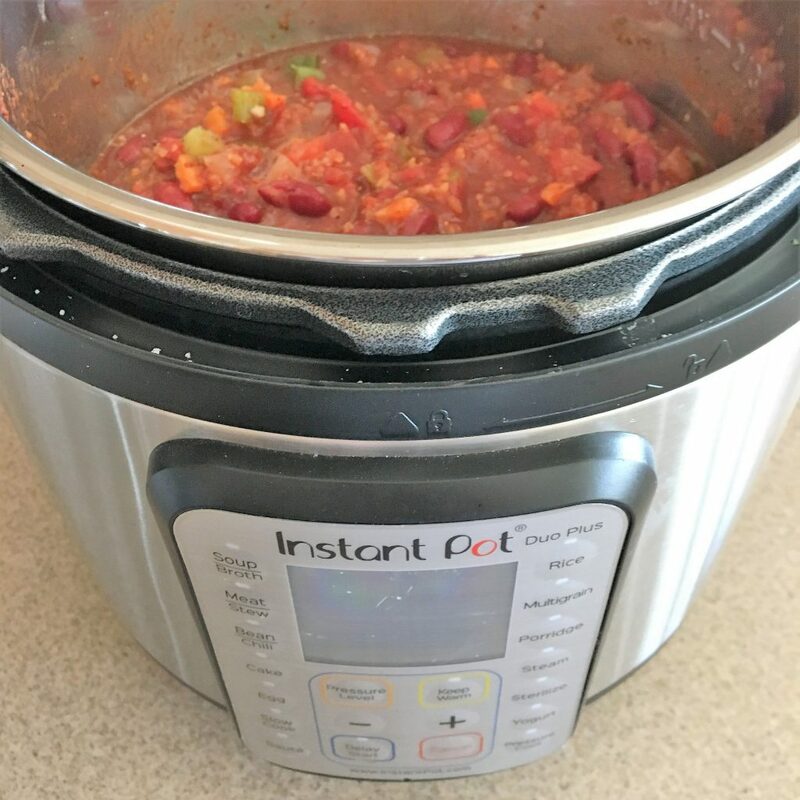 This allows the sauce to thicken quicker. And finally, use a good whisk. This is the major factor in the sauce. Most would think it is the ingredients, temperature or time. No, it is using a great whisk to mix all the ingredients. Ok, last tip. 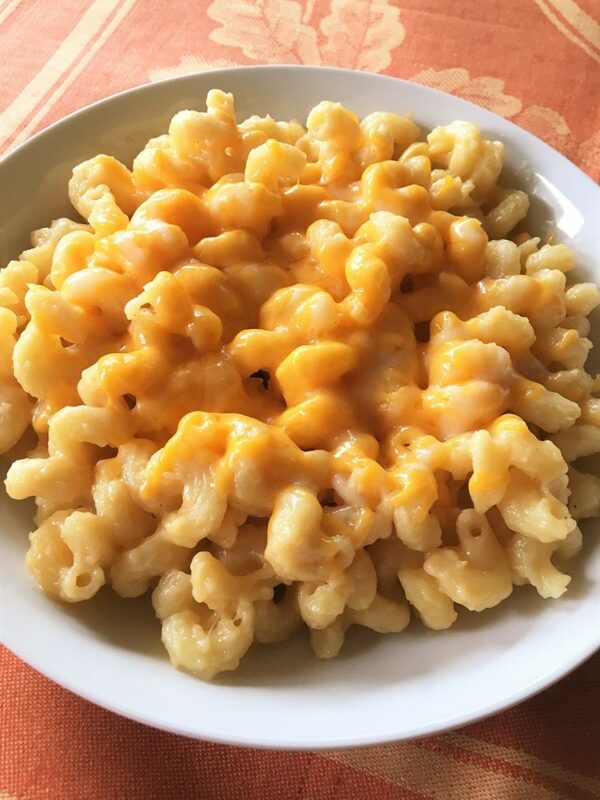 If you do not think this dish has enough cheese in it, you have the option to put your Homemade Mac and Cheese in a baking dish, sprinkle it with additional cheese and bake it for about 15 minutes to ensure an extra layer of cheesy goodness on your plate. So, what do you think? 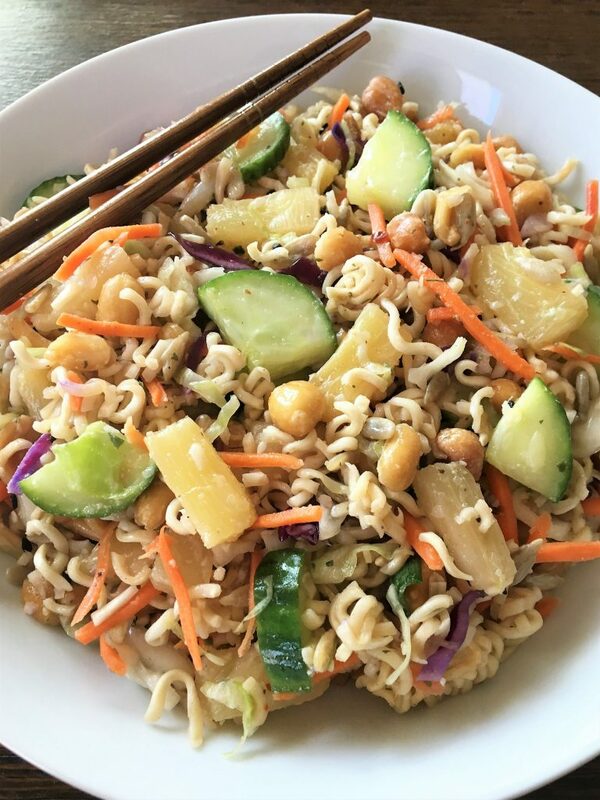 Did enough love and goodness go into this recipe? I truly think so. This dish has become a staple at the USO, as our young troops love it and it so reminds them of home. The other reason is that it brings together an incredible group of volunteers who love the mission and are so selfless in what they do. Some even work full time and on their days off, choose to volunteer for this mission. My heart goes out to my incredible core of volunteers, who put up with me each week, and give their heart. Thank you from the bottom of my heart. You are the best. 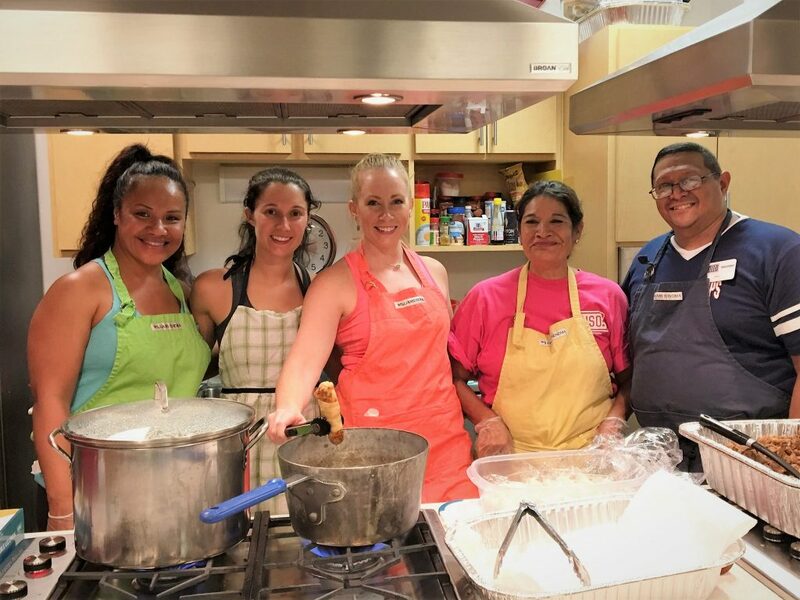 In honor of USO Volunteer everywhere, the Memorable Kitchen sends you a special thank you and a huge hug!!! You can use whatever cheese you like. Use all cheddar or mix it up with Pepper Jack, Cheddar Jack and other cheeses. These are just the ones I love. Cook pasta according to package directions. Drain and stir in 1 tablespoon of butter. Set aside. In a medium saucepan, melt ¼ cup butter on medium heat. Whisk in flour and cook for one minute, until smooth. Stir in salt and pepper, garlic and onion powders. Whisk in warmed half and half. Cook until thick and bubbly about 2 minutes. Lower the heat to low and stir in cheeses. Cook until all cheese is melted. Stir in additional milk or half and half as needed to thin cheese sauce, as desired. Pour over pasta and combine. If desired, pour into a baking dish and sprinkle with additional cheese. Bake for 15 minutes until cheese is melted and pasta is bubbly. 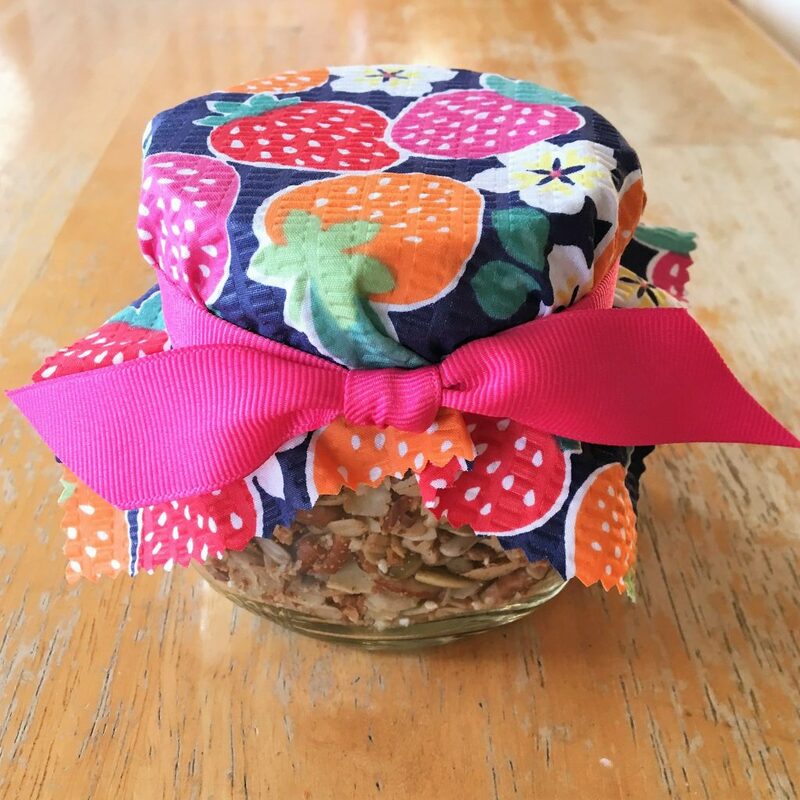 So, if you are a foodie or someone who just likes to cook and try new recipes, you probably have your fair share of cookbooks, magazine clippings, and recipes scribbled on everything from scrap paper to the back of envelopes. Ooor, maybe that is just me. But, if I just described you in any sort of wonderful way, then we are in the same club together…the recipe collecting club. Now, getting back to the recipe books. How many of you have a certain recipe book that you only make one recipe out of? Yes, you heard that right, ONE recipe. Well, that’s me again. 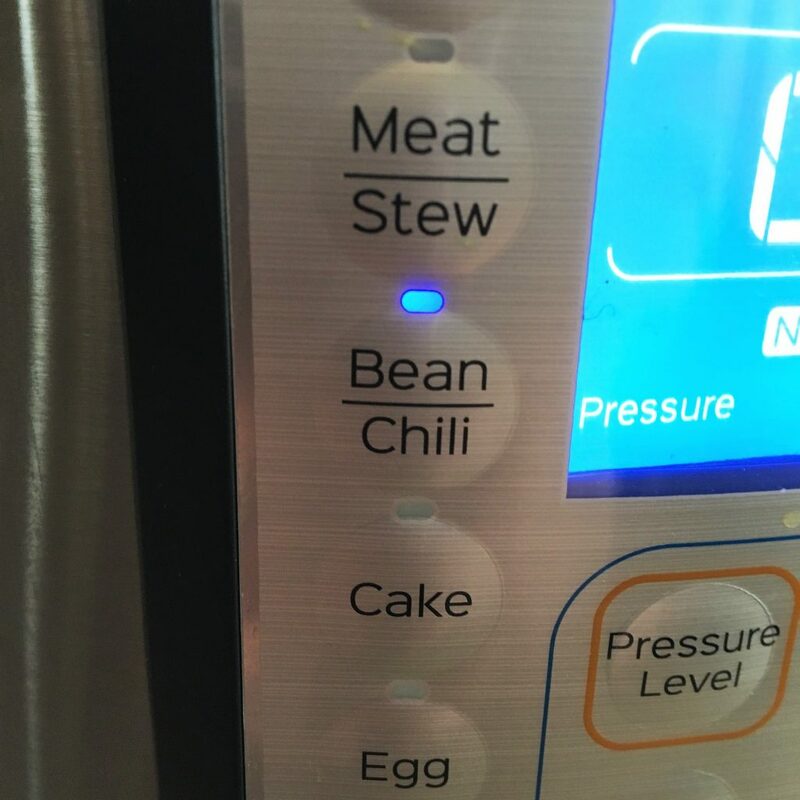 This is where my recipe for Russian Bean Salad steps in. 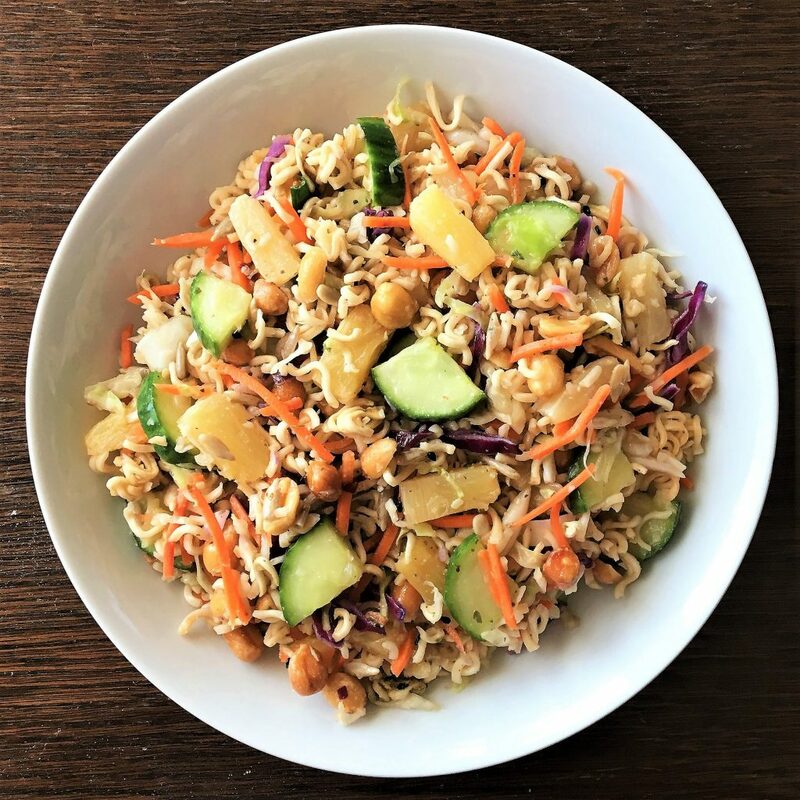 Over the years as I worked to lose weight after having my 4 wonderful children…and then once I hit 50, trying to not gain any more than 10 pounds a year, I often found myself following the Weight Watchers program. Again, let’s get pack to Russian Bean Salad. So, of course being a foodie, but on Weight Watchers, and being a foodie, I would buy every stinking recipe book they had to offer. It was fine that I had to go to Weight Watchers, but there was no way that I was going to miss out on cooking and discovering new recipes. So one day as I was weighing in at a meeting, I saw, sitting on the table next to me, a recipe collection entitled, Around the World, (Recipes from Home and Abroad). I had to buy it. It was calling my name. It was a collection of unique recipes from all over the world and some great traditional make over recipes of American Classics. 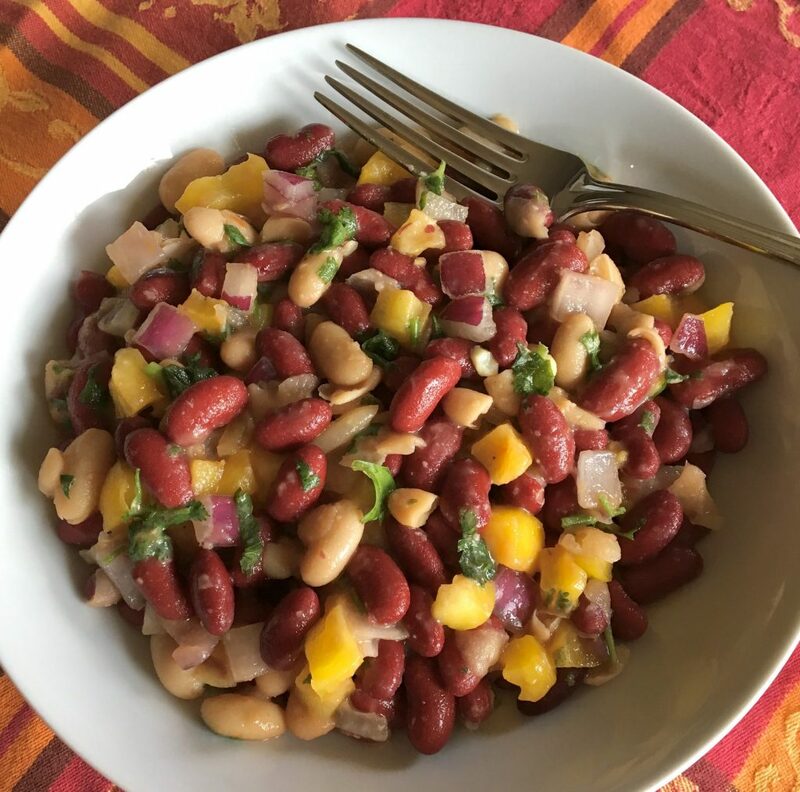 And that is where Russian Bean Salad became one of my favorite Weight Watchers recipes. So, as you can guess, this recipe ended up being the only one I ever used from that particular cookbook, but I am still glad that I purchased it so many years ago. Now, mind you, I have been going back and forth to Weight Watchers since I was 12 years old. Yes, you read that right. I was overweight as a child and was very successful with the program way back in 19?? The program has changed over the years, and has been great for thousands, probably millions of people who wanted to lose weight. It sticks to the basics and gives great support through meetings and online access. I personally like that I have always been able to continue to cook great food through the help of their cookbooks. 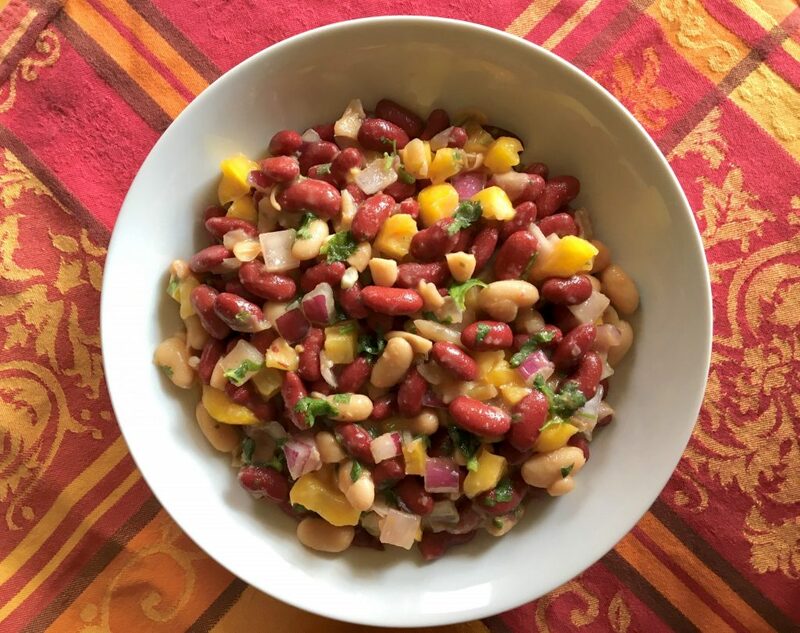 So, Russian Bean Salad has probably been one of my favorite Weight Watchers recipes over the years. One day I will share with you the recipes my mother cooked, (bless her heart), when the program included liver and 3 hot dogs as a meat serving. I still remember the Thanksgiving in, ok, I will say it, 1971 that she made the most amazing glazed carrots and savory green beans, all in line with the WW program. To this day, her love and support was the key to me losing the weight at the age of 12. And poor thing, she was skinny as a stick. 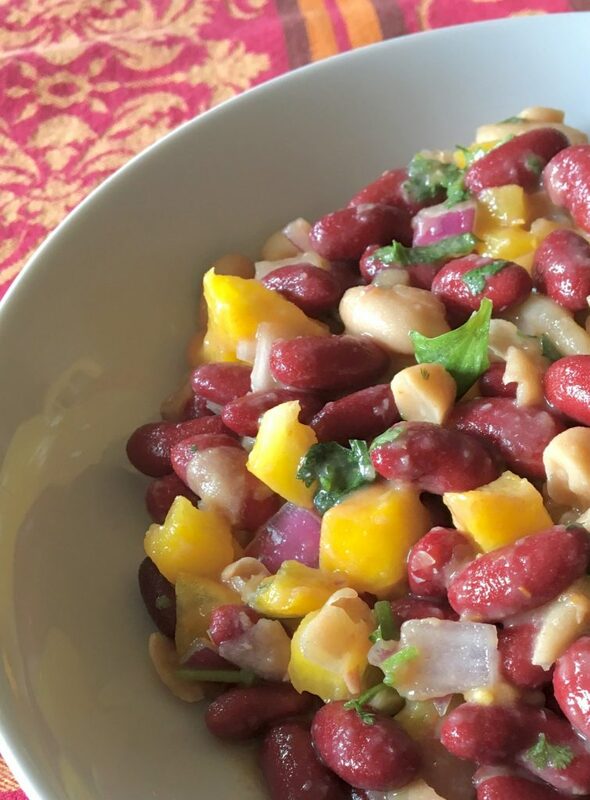 Alright, so back again to the Russian Bean Salad and what makes it so yummy? 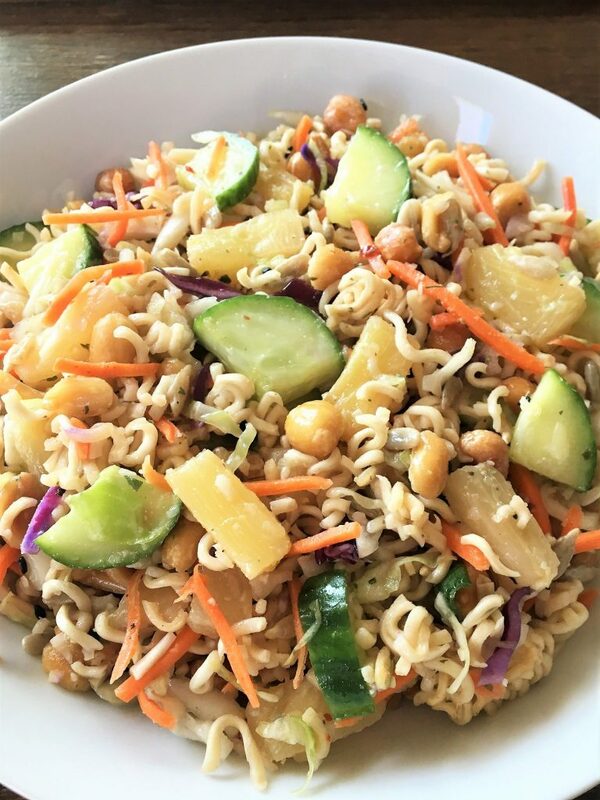 I think it is just the right combination of fresh flavors that come together in this salad. It is basically beans, peppers, onions, and a little cilantro. But, the kicker is the roasted tomato dressing! You literally roast tomatoes in the oven and combine them with seasonings in the blender and there you have it, an amazing salad creation, thanks to Weight Watchers! So, add this colorful, healthy salad to your fall table. 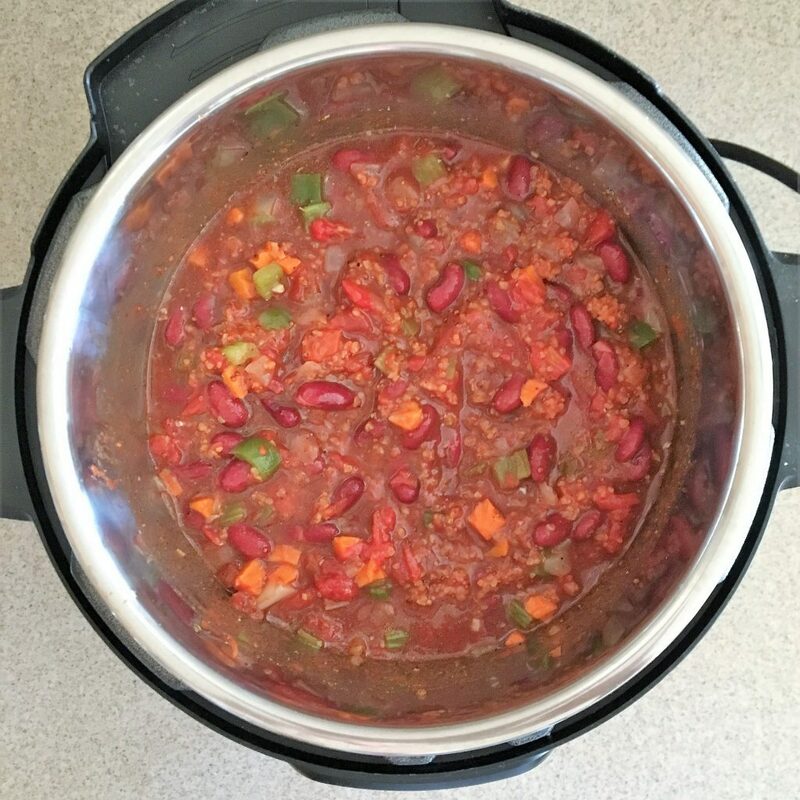 I think it pairs well with any protein and it would be a great side dish at a Tailgate Party or back yard, cool weather barbecue. Enjoy, and you don’t even have to tell anyone it is from Weight Watchers! Happy, healthy cooking from the Memorable Kitchen. Place tomato wedges on a baking sheet coated with cooking spray. Lightly coat the tomatoes with cooking spray and sprinkle with ¼ teaspoon salt and pepper. Bake at 350 degrees for 1 hour. Place tomatoes, remaining ¼ teaspoon salt, vinegar, broth, olive oil, mustard, sugar, and garlic in a blender or food processor. Blend until smooth. Pour into a medium bowl. Add onion, bell pepper, ¼ cup cilantro, and beans to the tomato mixture. Toss well. Serve chilled or at room temperature. June is such a great celebration month for so many people…Graduations, weddings, the start of summer vacation, and in our house, a birthday and anniversary on the same day. June 2 marks the day my husband and I graduated from the Academy (A-hem) a few years ago, our youngest daughter’s birthday and the day I launched my blog! It truly is our celebration day! That is why this recipe for Homemade Ice Cream Cake was a perfect way to mark the occasion. Ok, I hope I did not mislead you with the title for my Homemade Ice Cream Cake. Yes, you do make it all in your own kitchen. Yes, it is an Ice Cream Cake. But, it does not involve making homemade ice cream, what so ever. I do hope that makes you smile. If you do want to learn how to make good homemade ice cream sometime, I promise, I will share that with you. 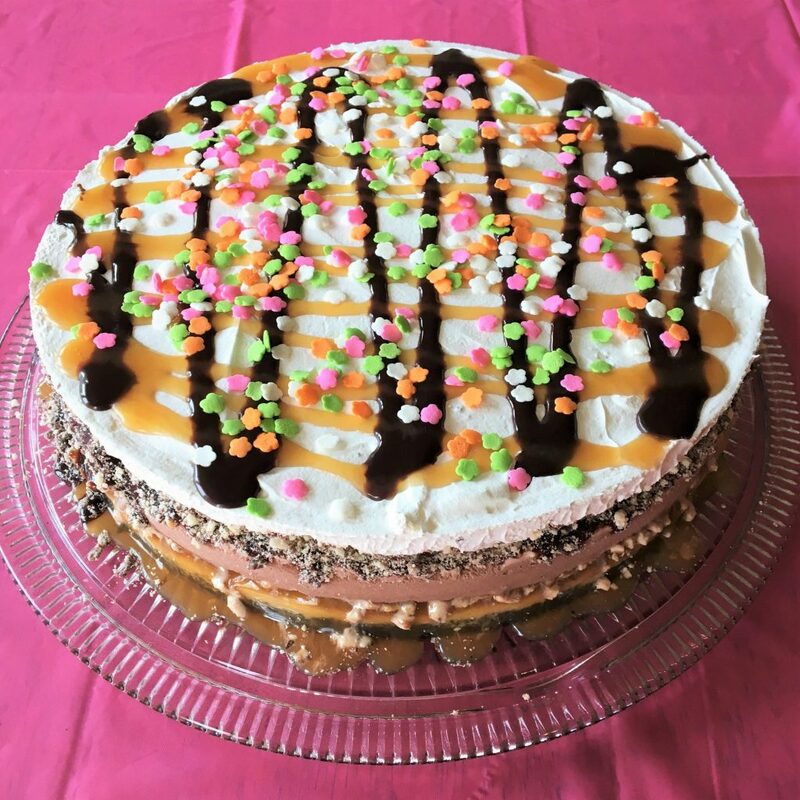 But, for now, I am going to show you one of the easiest and fun ways to make a delicious Homemade Ice Cream Cake for someone’s birthday, your next barbecue, or just as a fun summer dessert. 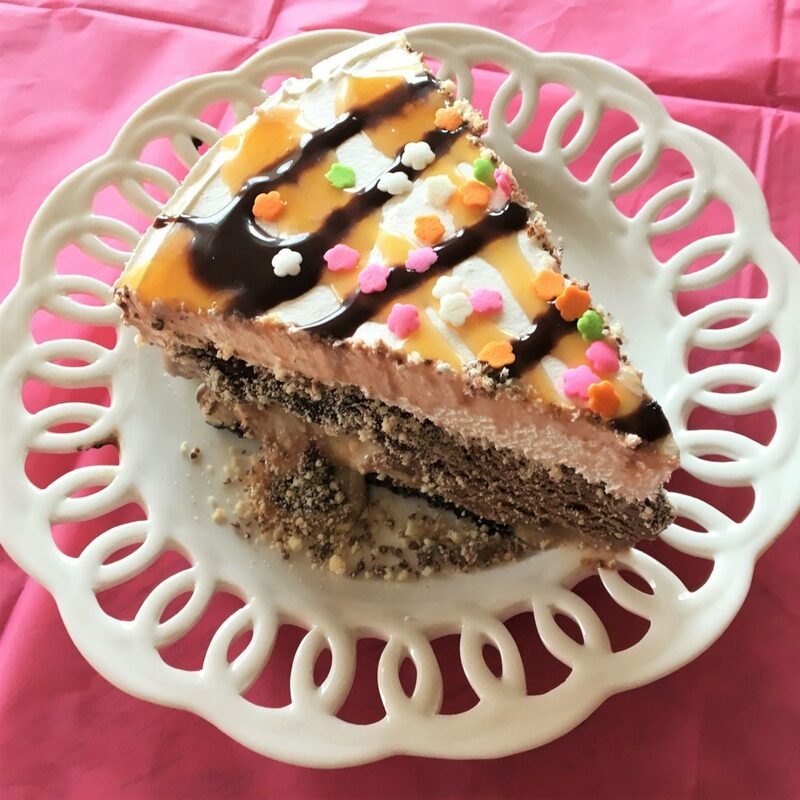 This recipe for Homemade Ice Cream Cake was invented years ago when my youngest daughter, Alison wanted an ice cream cake for her birthday. Her birthday parties usually involved outdoor water play and nice cool refreshments, so this cake was perfect! For her ice cream cake she wanted specific flavors of ice cream and toppings which I could have requested at the local ice cream shop for them to make. But on this birthday occasion, I ran out of time to put in a specialty order. What’s a busy mom to do? Tackle it on my own, of course. So, I marched to the grocery store and picked out the perfect flavors, fillings, sprinkles and even some yummy cookies as the ingredients that would soon come together to make a gorgeous, sweet, cool dessert. Well, the rest was history. After putting together all the sweet layers of ice cream, fillings, crushed cookies and extra goodies, it was a hit! Now, this is my daughter’s request for every birthday. Sometimes we mix up the flavors, sometimes we stay with her favorites. 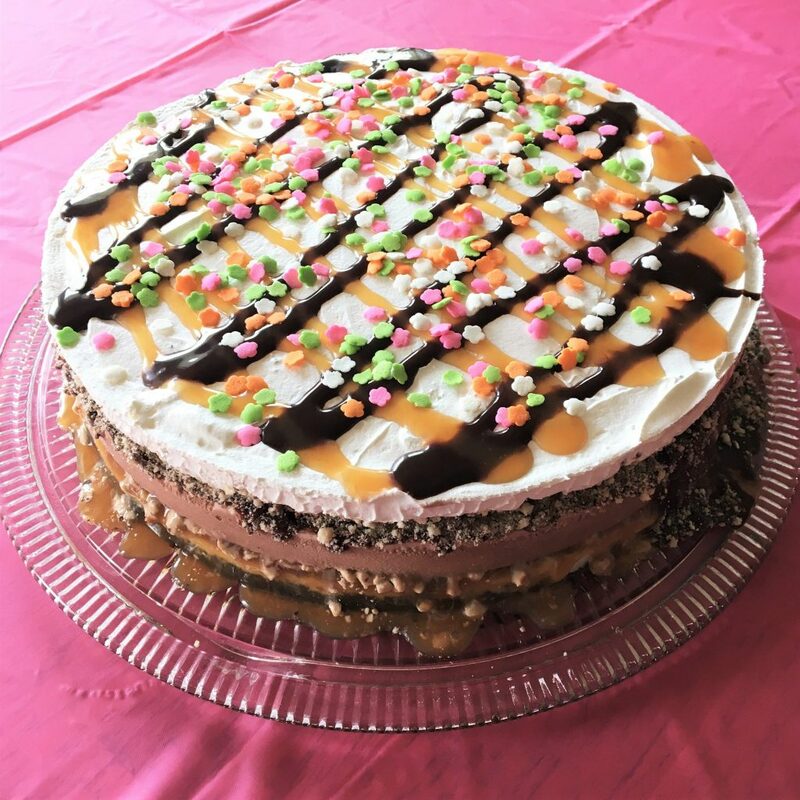 The beauty of this Homemade Ice Cream Cake is that with all the new flavors of ice cream, cookies, toppings, and candies, the sky is the limit on the combinations you can come up with. My recipe for Homemade Ice Cream Cake is basically layers of chocolate, vanilla and caramel swirl ice cream, layered with Oreo’s and Milano cookies. The extra crunchies in between the layers are mini chocolate chips and Heath Bit O’ Brickle Toffee Bits. The toppings are chocolate and caramel. So, I guess it’s technically a Toffee Ice Cream Cake. But, again, the flavor combinations are endless. This year when I went to make the cake I discovered so many new flavors of ice cream, not to mention all the yummy new cookie and candy flavors. I even came across some Cinnamon Bun Oreo’s…what??? You can get as crazy as you want to. 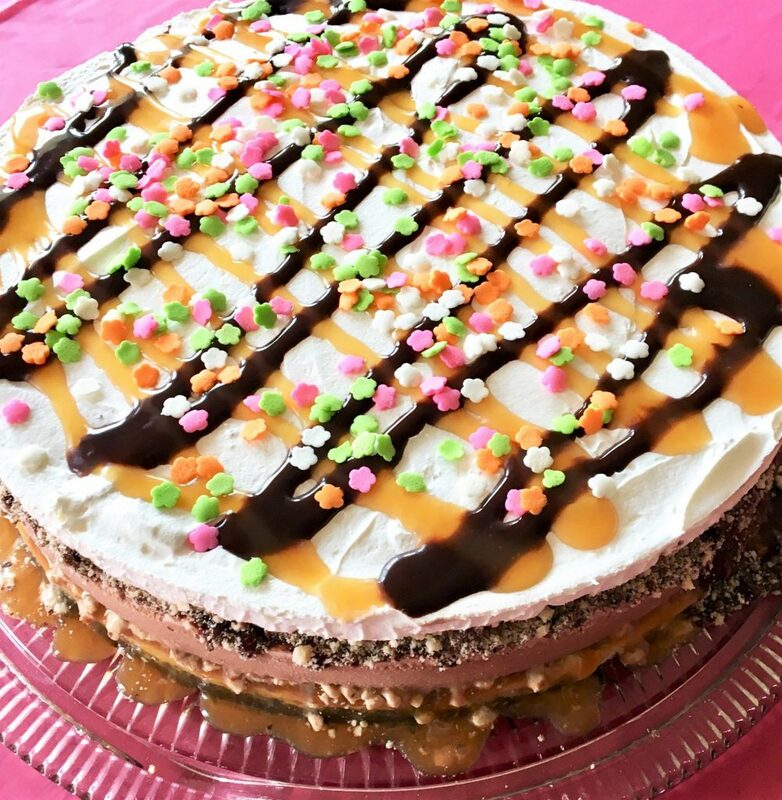 Have fun combing the aisles of the grocery looking for the perfect combination of ice cream, cookies, candy and toppings for your perfect Homemade Ice Cream Cake. 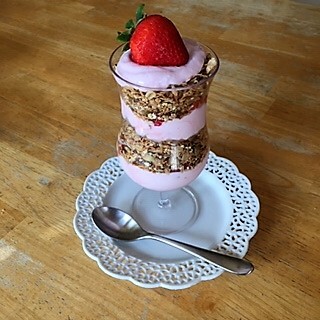 Be creative, have fun and enjoy making your own version of this super easy, no bake, summer-happy dessert. So, Happy Birthday to my Daughter and here’s to celebrating and sharing 3 years of recipes from The Memorable Kitchen!!! Crush 2 cups of the Oreo Thins (about ½ if the package) in a food processor or place in a large Ziploc bag and crush with a rolling pin. Combine with melted butter. Press into the bottom of a 9 inch spring form pan. Chill for 10 minutes. Soften one of the ice cream flavors for 20 minutes. Spread over the cookie crust. Freeze for at least one hour. Crush one package of Milano cookies in a food processor. Sprinkle a thin layer over the first layer of ice cream. Sprinkle ½ cup of chocolate chips over cookies. 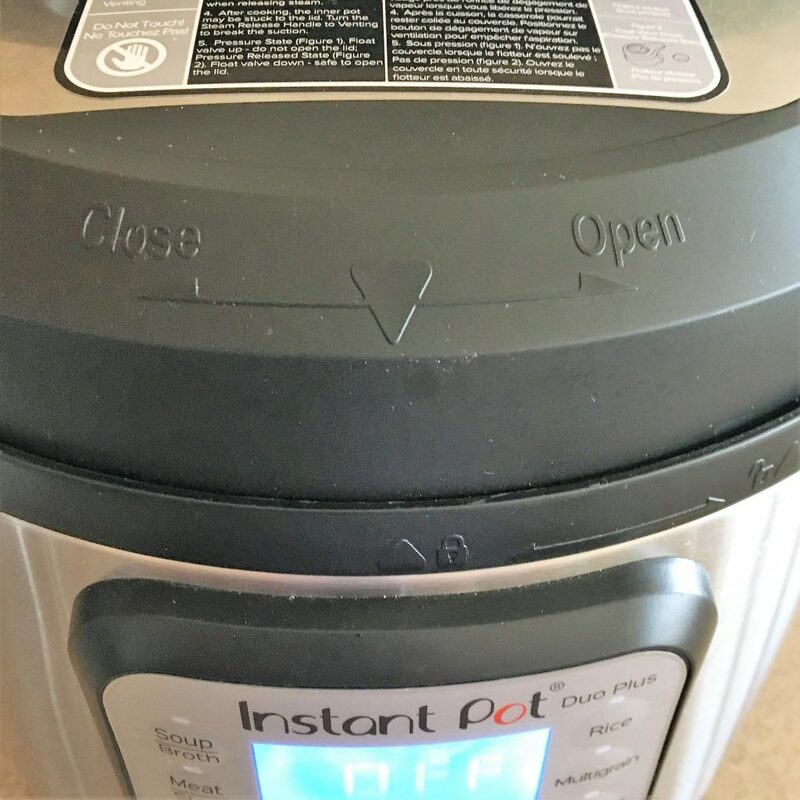 Soften second ice cream flavor for 20 minutes. Spread over cookie layer. Freeze for at least one hour. Sprinkle another of cookies over ice cream and sprinkle ½ cup of Heath bits over cookies. Repeat with as many layer that your pan can hold, leaving ½ inch for whipped topping. Spread Cool Whip over cake. Freeze for another hour. Before removing from pan. Drizzle Caramel and Chocolate Toppings over cake. Top with candies or sprinkles. Remove from pan and place on a decorative plate or platter. Place additional Milano Cookies around cake like a fence. Serve immediately or freeze until ready to serve. Note: You can substitute Strawberry Ice Cream Topping, Chopped Fruits for Chocolate or Caramel Toppings. Try the following flavor combinations. 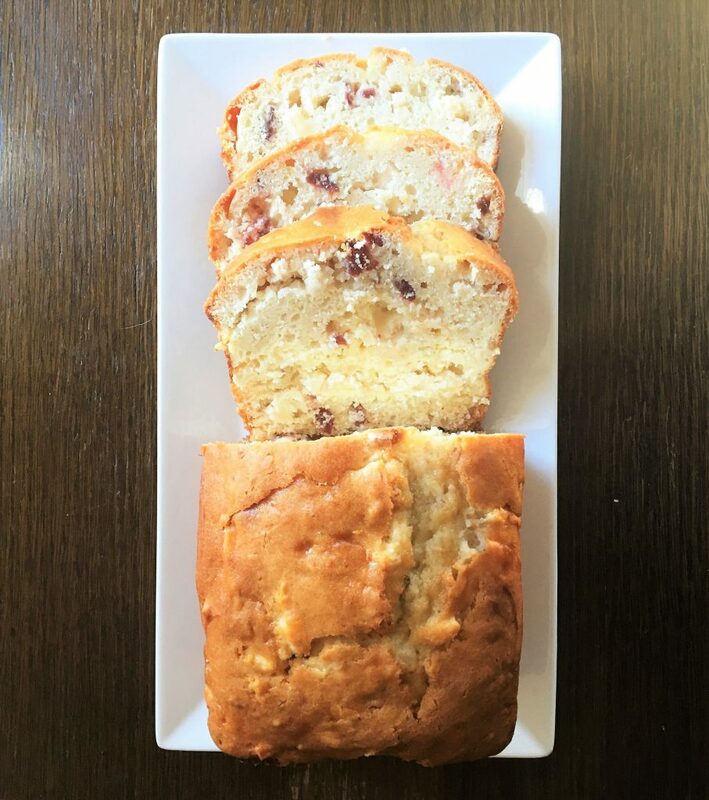 I first tried Rhona’s Creamy Apple Almond Crunch Bread about 25 years ago. We had just moved from our 3 year assignment in Germany and were settling into our new home on the Naval Base in Rhode Island. It was a difficult move in the sense that the years we spent in Germany were amazing. We left lots of friends and memories there. Also, this assignment was only a year long, so I knew I would not really have a lot time to make close friends or take in all the sights that I was hoping too. Well, it took only a few weeks for that thought to be proven wrong. I immediately made friends with some incredible woman, thanks mostly to my son Paul who combed the neighborhood looking for friends (he had no qualms about knocking on our neighbors’ door asking if they had boys that would like to play). He was only 4 at the time, so life meant finding other kids with a Big Wheel, some sporting equipment and maybe even a kiddy pool. You know, the simple things. Because of his search, I became friends with two women who I hold close to my heart to this day. The kind of friends that you connect with instantly, who have your same sense of humor and who take life with a grain of salt. One of those woman, you guessed it, is Rhona. A smart and fun woman, born and raised in England, who helped me to quickly get out of my post-Germany slump! Rhona, along with many of the spouses in our little housing community, quickly bonded. All of our husbands were in a one year leadership course and were busy most of the time with papers, presentations and all of their classes. Darn! What that meant is that we all had to make the most of our days getting to know one another over coffee, exploring the beautiful area and helping our kids to have the best time they could in the one short year. That is where this recipe for Rhona’s Creamy Apple Almond Crunch Bread was discovered. Another quick story about this assignment. We were stationed for the year on a Naval Base in Newport, Rhode Island. We had been stationed only on Air Force bases up to this point. Now, the facilities were all basically the same. What was different though, were all the Navy spouses I met that year. When I say, different, I mean in the best way possible. These women were amazing! They knew the art of getting a house set up quickly. Most of them had pictures hung, dishes put away, living rooms decorated, garden planted, in just 2 short weeks! Wow! I pretty much left the pictures leaning in rows against the wall, and at the 6 month point, realized I would be packing them up soon, so what was the point? Not entirely true, but I certainly was not the Move-In Ninja that my Navy Wife Sisters were. I guess their motto was to have the house “Guest Ready” for the first coffee get together or dinner with the neighbors. Me on the other hand, always volunteered to bring the food. Or even better, if I had my friends over, I had coffee brewing, something baked, and my laundry ready to be folded, just in case anyone was bored and wanted to help me out! I can’t remember when Rhona first made this bread, but what I do know is, that I fell in love with it and immediately asked her for the recipe. I still have the original recipe card in my file. Seeing her handwriting really brings back memories of our fun times together and the beautiful friendship we established. It probably was one of our brunches or coffee get-togethers that she brought it to. 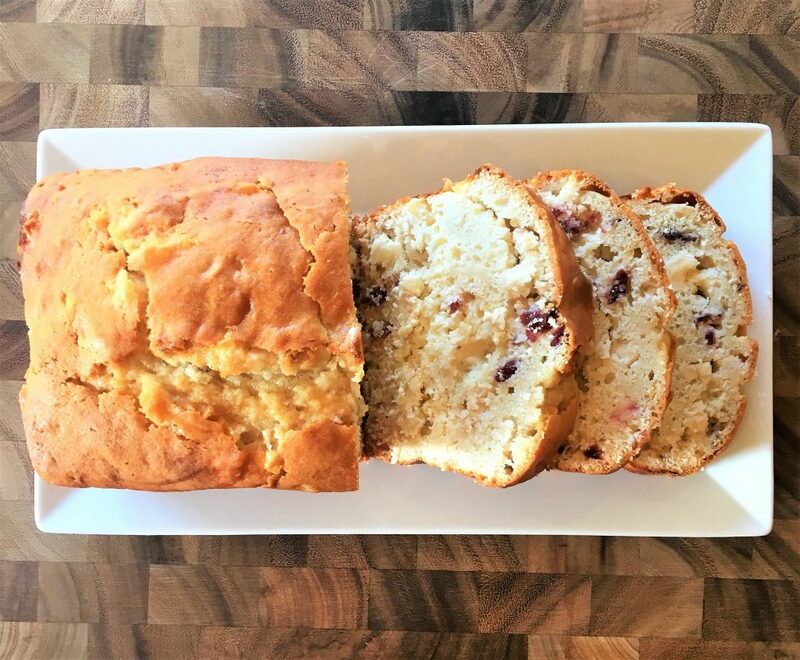 What I love about this recipe is that it starts with a quick bread mix. Then with a layer of cream cheese, toasty almonds and apples, you take the bread over the top! 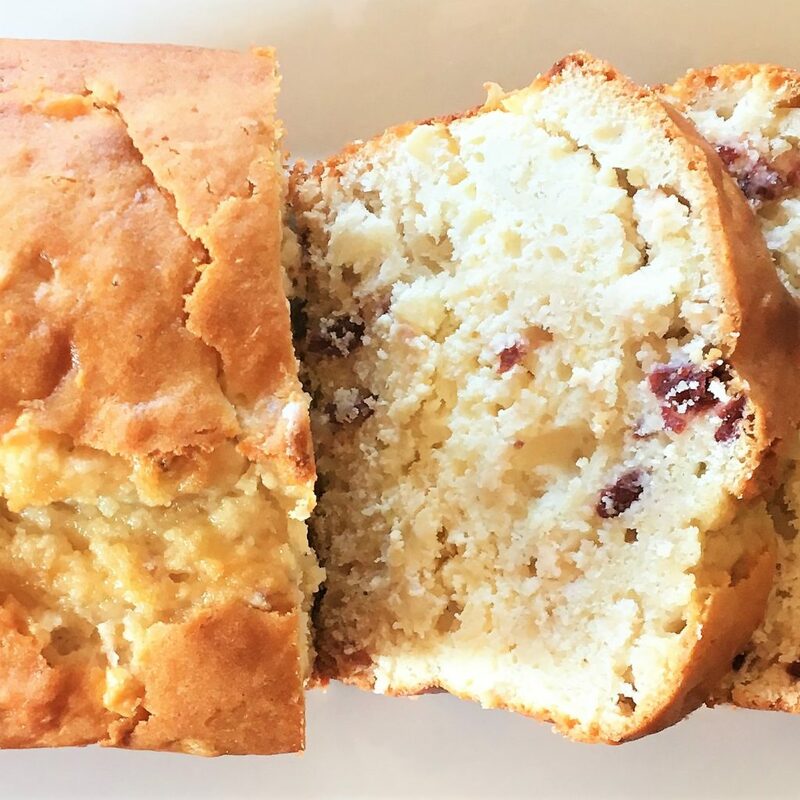 By finishing it with a glaze and more almonds for extra crunch, you have an unforgettable bread perfect for any fancy brunch or quiet get-together with friends and family. 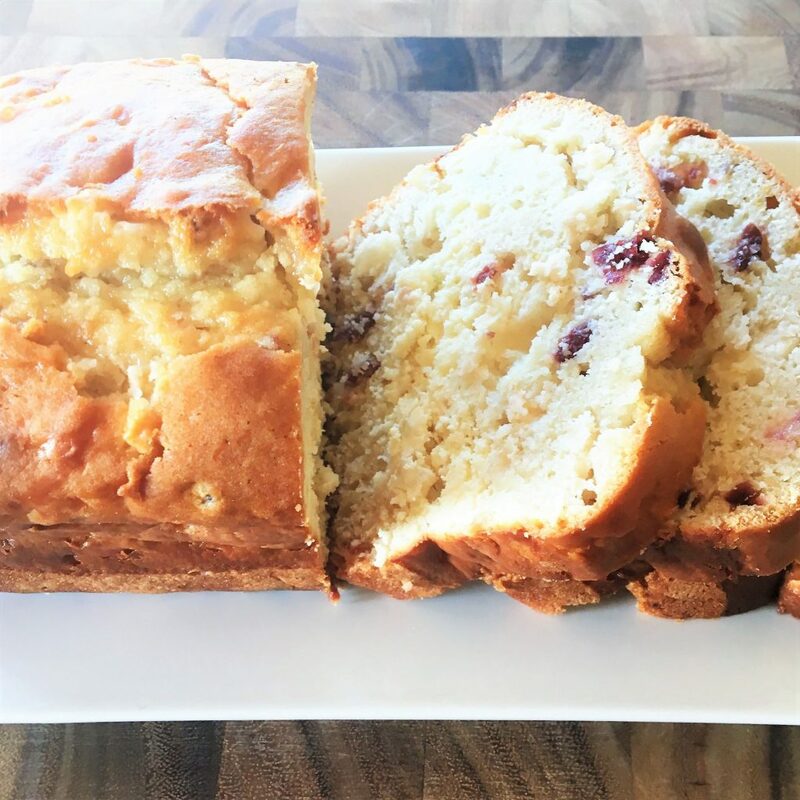 It is memorable for me because when I make it, I think of Rhona sitting down to a proper cup of English tea with a slice of her Creamy Apple Almond Crunch Bread. So, take the time to savor the days or years you have with friends. Share your recipes, cook together, laugh together, never forget that they are etched in your heart. 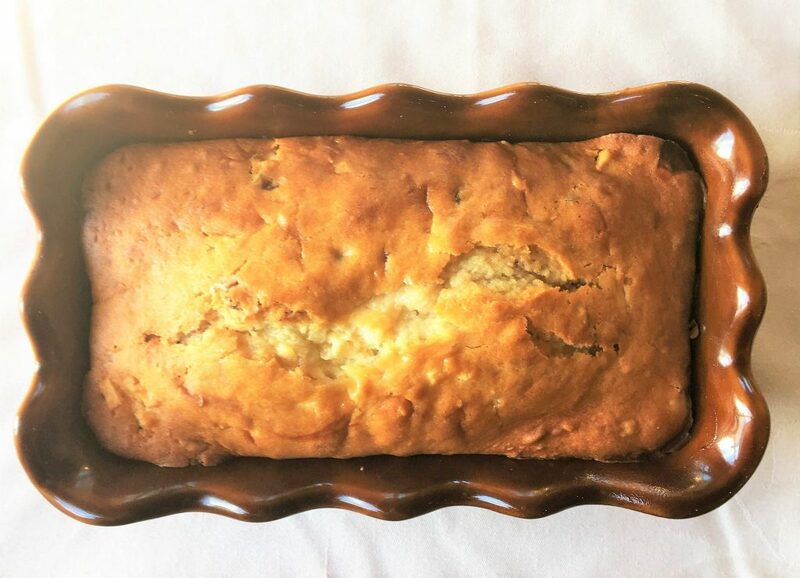 On Mother’s Day, I dedicate this recipe to all my military friends who helped me in all of our assignments…those that taught me to set up my house quickly, to rely on your friends in a pinch, to spend time together as often as possible and to never forget how to have fun in the process! I am a better person because of each and every one of you! Happy Mother’s Day and Military Spouse Appreciation Month from your friend at the Memorable Kitchen! In a small bowl, mix together by hand or with a mixer, cream cheese, sugar, and egg. Mix until smooth. Fold in ½ cup of chopped apple. Set aside. In a separate mixing bowl, combine quick bread mix, water, oil, 1 egg and almond extract. Stir by hand until moistened. Fold in the other ½ cup of chopped apples. Prepare a loaf pan with cooking spray. Pour ½ of the batter into the bottom of the pan. Carefully spoon the cream cheese mixture over batter. Spoon remaining batter on top of filling. 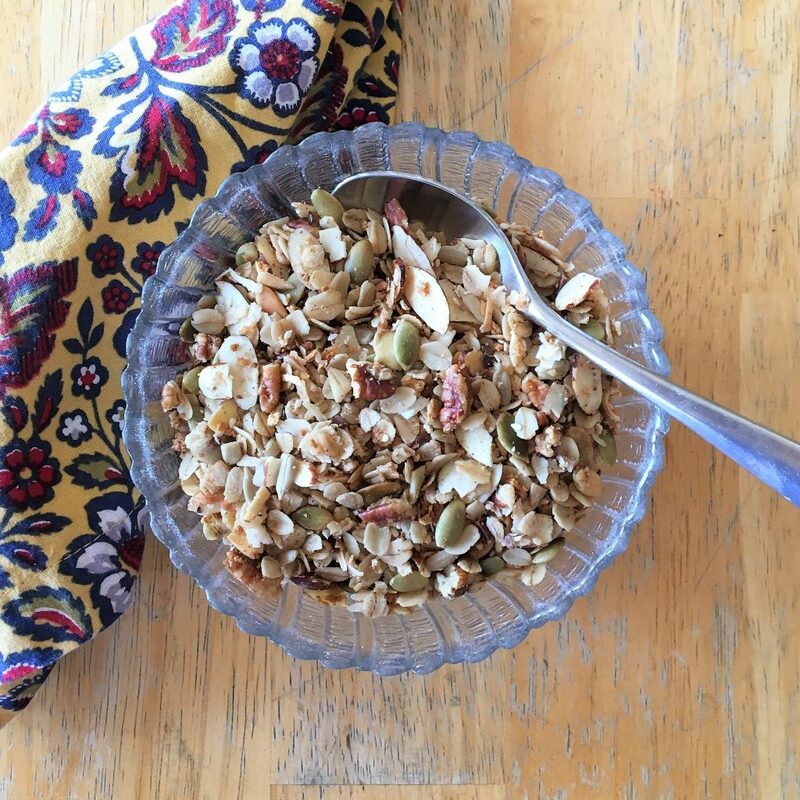 Sprinkle with almonds, if desired. Bake at 350 degrees, 70-85 minutes for an 8 x 4 pan and 65-75 minutes for a 9 x 5 pan. Remove from pan. Let cool completely. Melt apple jelly in a sauce pan. Brush over bread. Store in the refrigerator. Happy Spring! Happy Farmer’s Market Days! Happy Fresh Cooking! 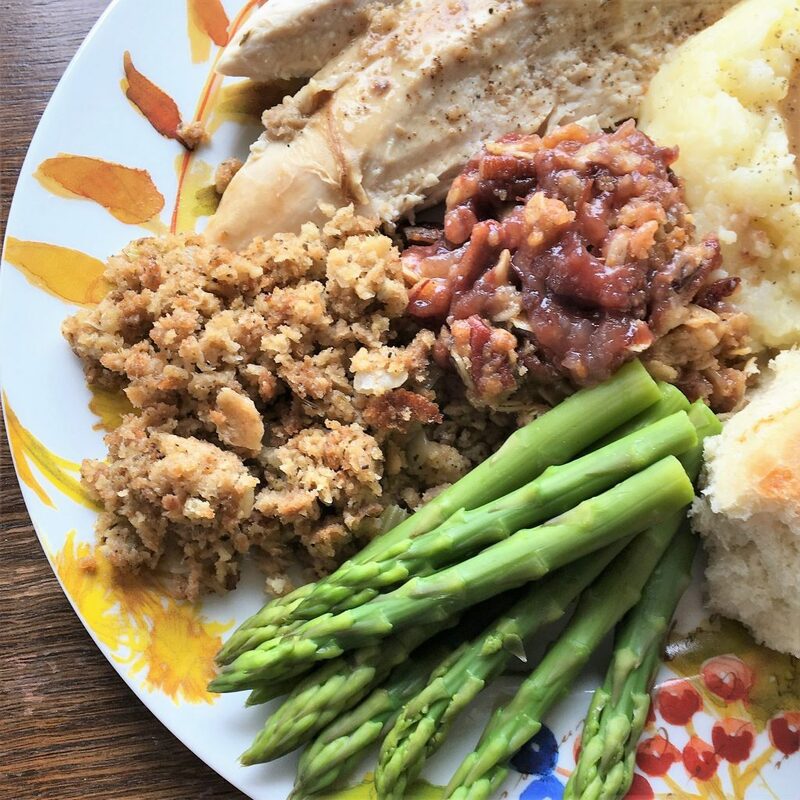 Although I think my favorite time of year to cook is during the Thanksgiving and Christmas holidays, truth be told, I think I am starting to love Springtime even more. It’s all probably due to the fact that I am making more dishes that are fresh, have more whole ingredients and are lighter. When I say lighter, yes, lower in fat and calories, but also lighter tasting. That is why I came up with this wonderfully easy and fresh Garden Vegetable Dip. It really is so simple, and actually gets better if you make it ahead of time, like the day before your special brunch, shower or barbecue. It starts with a base of light sour cream and fat free Greek yogurt. Then, all those yummy flavors from the vegetables, herbs and seasonings marry together into a beautiful, light and healthy dip. 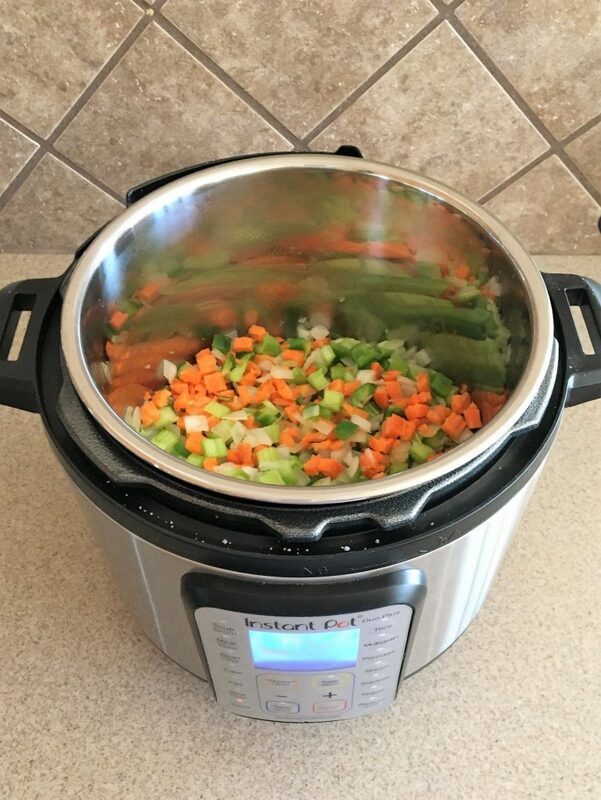 When I say simple, the one thing that helps me put together this Garden Vegetable Dip so quickly is my favorite gadget in the world…my handy, dandy chopper. There are several versions of vegetable choppers out there, but this one is my favorite. I especially like the plates that are good for chopping small things like garlic. Everyone always asks how I make such perfectly uniform size veggie pieces in all my recipes. I could tell them it is my amazing knife skills (NOT)! Instead, I do tell them the truth about my favorite kitchen tool. So, what else makes this recipe for Garden Vegetable Dip so easy? It is the flavorful addition of a dry packet of Hidden Valley Ranch Seasoning Mix. After that you can give the dip a burst of flavor with additional herbs and spices. You can make the basic dip or change up the flavor profile by adding cumin, chili powder and cilantro for a Tex-Mex flare. Or how about Cajun with some creole seasoning, capers, cayenne, and chives. I guarantee it will be the new, fresh appetizer you can add to any party table. Finally, I do want to share a cute story about my Garden Vegetable Dip. 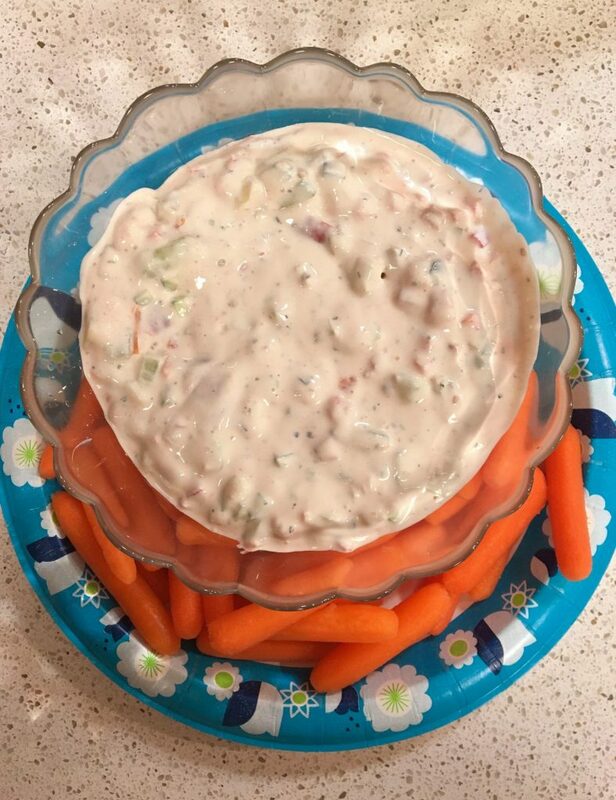 I often make this dip for my Cooking Classes at the USO. Most of the troops like recipes that are loaded with vegetables and are great healthy alternatives. 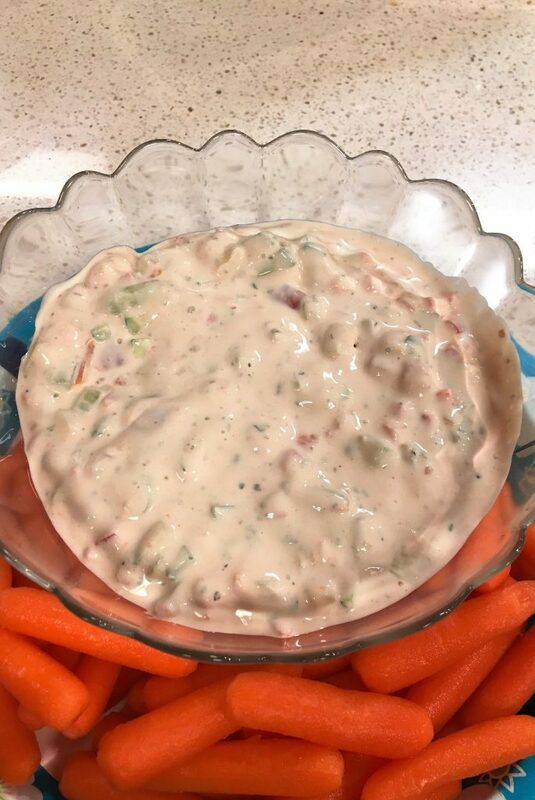 But, there are still a few of “the kids” that are not too fond of vegetables, especially when I tell them all the ingredients that are in this dip. But, just like a mom, I suggest trying “just a little”. Once they taste it, they become believers! 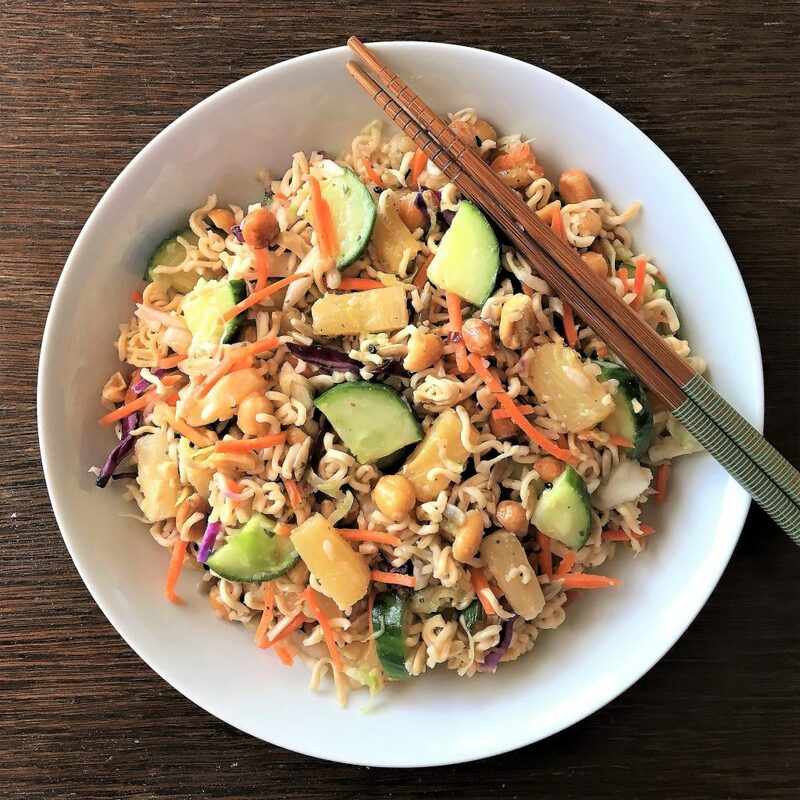 I think it is because like most healthy recipes, if you add some great flavors like herb and spices, you will not even know you are eating something that is good for you. So have fun experimenting with my Garden Vegetable Dip. Be creative by adding different fresh herbs and spices. Whatever your flavor profile, it will be so fresh and healthy with all the great veggies you are starting with. And, Happy Spring cooking from the Memorable Kitchen! Cover and refrigerate for one hour or up to 24 hours before serving. Serve with a variety of fresh vegetable and crackers. Can be used as a sandwich spread or condiment for chicken or fish. Note: You can omit the Hidden Valley Ranch Seasoning if you are watching your salt intake. Just substitute with additional herbs and salt-free spices. Happy Easter, Passover, and Spring to everyone. 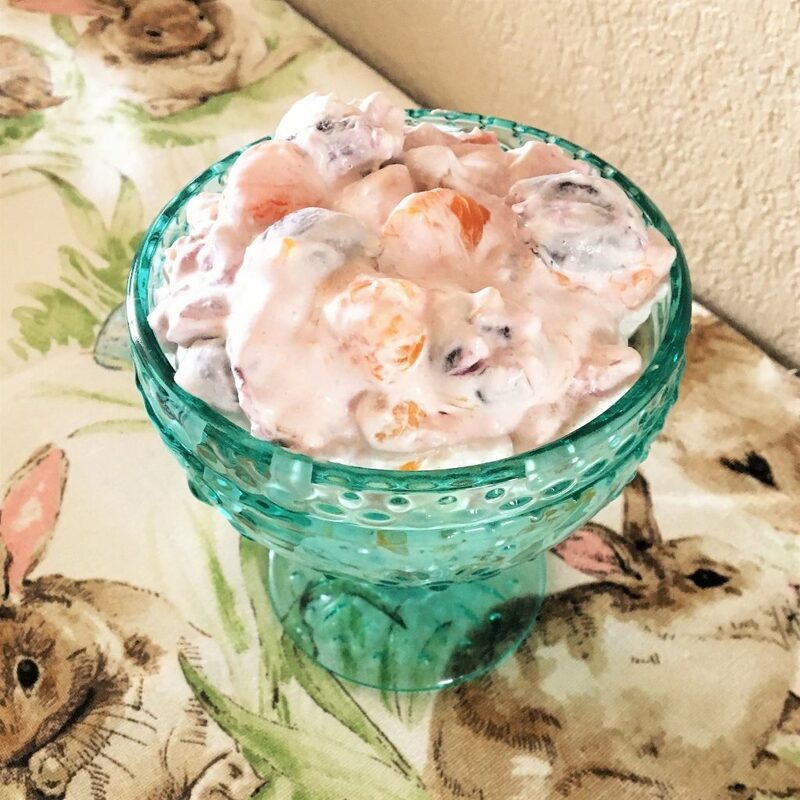 This recipe for Light Ambrosia Salad has a special place in my culinary collection. I first ate this wonderful salad, also known as Twenty-four Hour Salad, almost 39 years ago on Easter Sunday. I was a cadet at the Air Force Academy at the time and I was invited over to my sponsor family’s house for Easter dinner. It was the first time meeting them and I was very excited to spend a special holiday away from the academy grounds. Little did I know that this family would become my home away from home. So much so, that I considered their children my “little brothers and sisters” and Joe and Karie became my second parents. As time went on, and I had a family of my own, my children even called them Grandpa Joe and Grandma Karie. Karie is an amazing cook and for this particular dinner she had a spread that she spent hours cooking, all the family favorites, that made me and my friends feel like we were back home again. 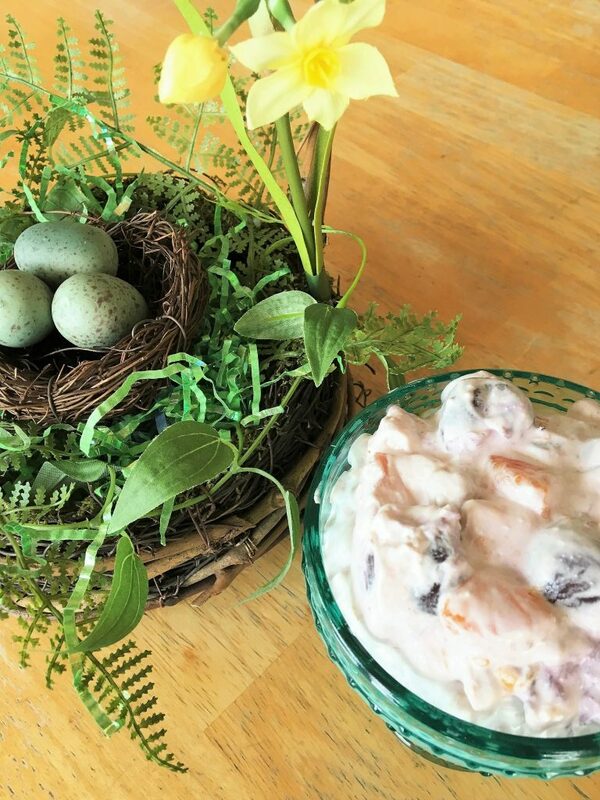 I know there were tons of goodies, but the one that stood out in my mind was this recipe for Light Ambrosia Salad. What really made it different for me was how light it was compared to other fruit salads like this. I don’t know about you, but when I think of an Ambrosia Salad, it usually is the furthest thing from light. You know, it’s the dish your Great Aunt brings to the holiday gathering that is laden with a heavy mayonnaise dressing, coconut, fruits you are not even sure of what they are and, gulp, not the thing you run to first. It’s typically the dish that you were forced to “at least take one bite of”, so as to be polite. 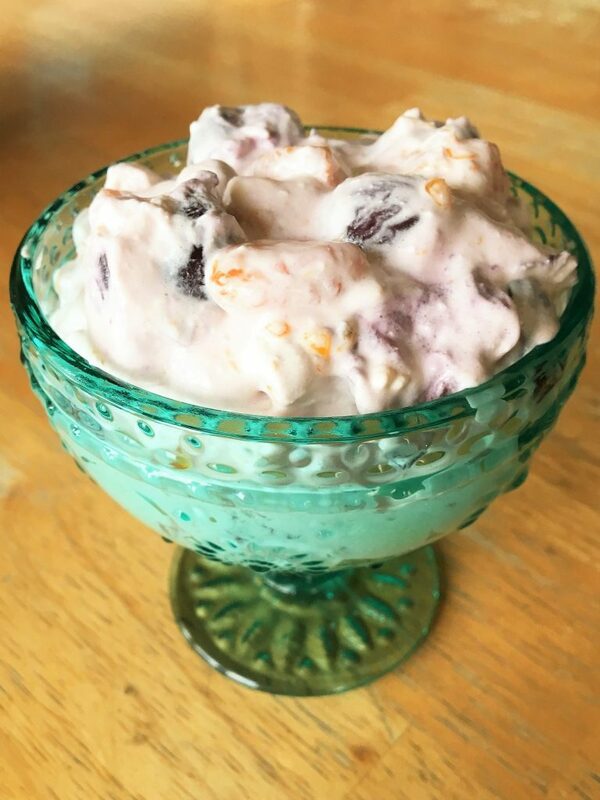 However, I just love how this version of Light Ambrosia Salad, truly is an updated Ambrosia recipe. A wonderful combination of fruits, in a light and tangy lemon custard, with the added crunch of cashews or almonds. You are going to love it! 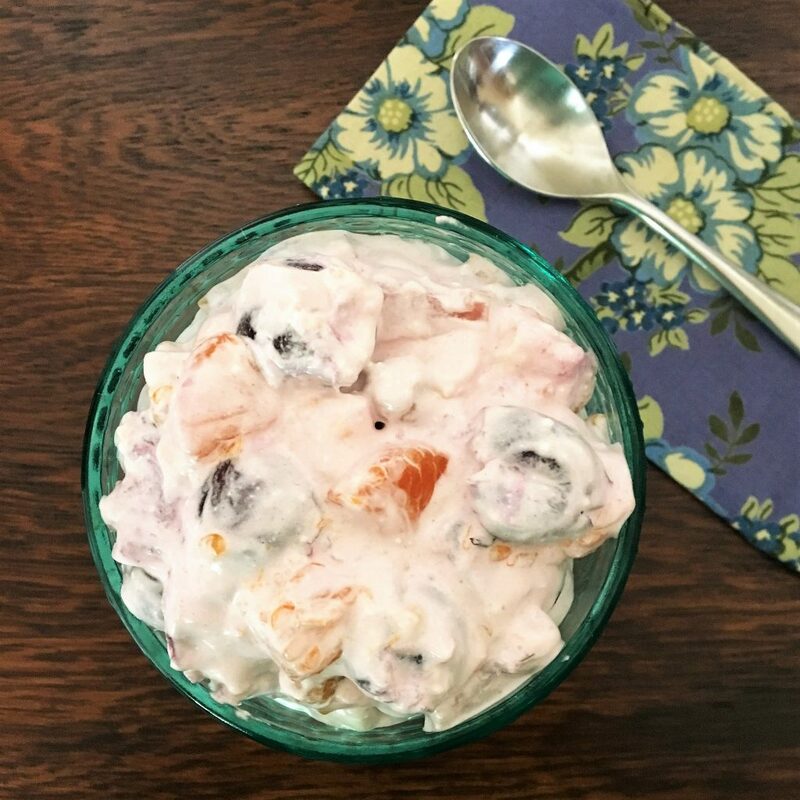 Light Ambrosia Salad will be perfect for that next brunch you are planning. The next baby or bridal shower you throw, or as a light spring dessert. 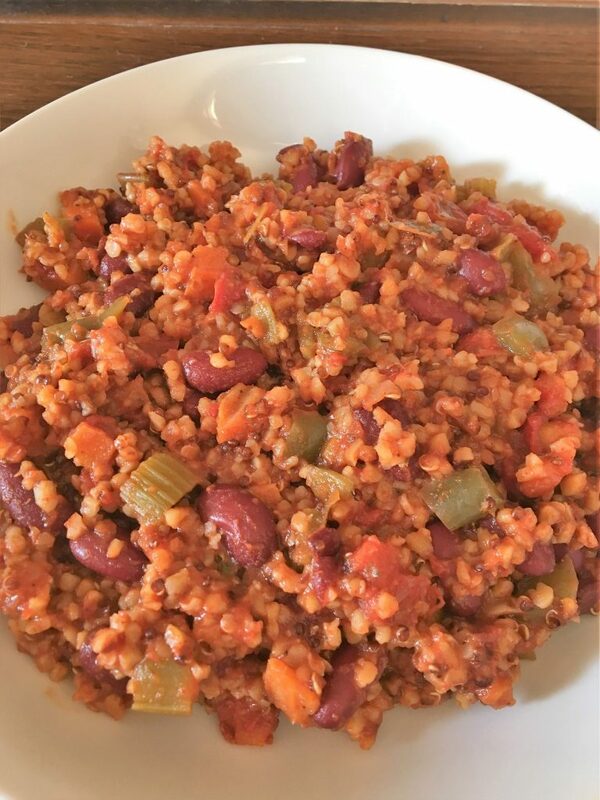 So, enjoy this recipe that has a special place in my kitchen and the memory of when I first tasted it, has a special place in my heart. Happy Spring Gatherings from the Memorable Kitchen. Drain all the fruit, reserving 2 tablespoons of the pineapple juice. Place the fruit together in a bowl. Set aside. Place pineapple juice, egg yolks, sugar, lemon juice and light cream in a bowl. Whisk together until well blended. Place ingredients in the top of a double boiler, or if bowl is heat resistant, place over a pot of simmering water. Cook for approximately 7-10 minutes or until mixture thickens. Remove from stove and cool to room temperature. Combine lemon custard, fruit, whipped cream and marshmallows, if desired. Cover and refrigerate for several hours. 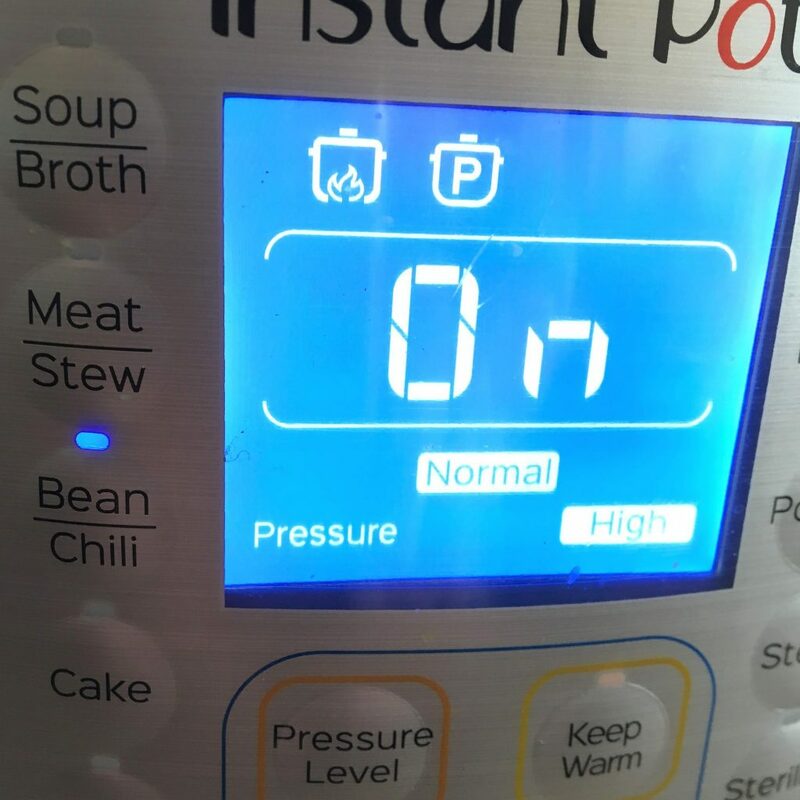 The recipe recommends 24 hours. Stir in nuts before serving.